On March 25, 2015, the Securities and Exchange Commission (the “SEC”) adopted amendments to Regulation A pursuant to the mandate of Section 401(a) of the JOBS Act. The amended rules known as Amended A+ were adopted to facilitate capital-raising by smaller companies. Regulation A+ expands existing Regulation A. Regulation A+ offerings can be used in combination with direct public offerings and initial public offerings as part of a going public transaction. The exemption simplifies the process of obtaining the seed stockholders required by the Financial Industry Regulatory Authority (“FINRA”) while allowing the issuer to raise initial capital enabling small companies to go public without a reverse merger. Both public and private companies can use Regulation A+ but the exemption cannot be used by companies that are subject to the SEC’s reporting requirements. Regulation A+ may prove to be a popular exemption for private companies in going public transactions where the issuer seeks to ease into the public company reporting process without using a reverse merger. 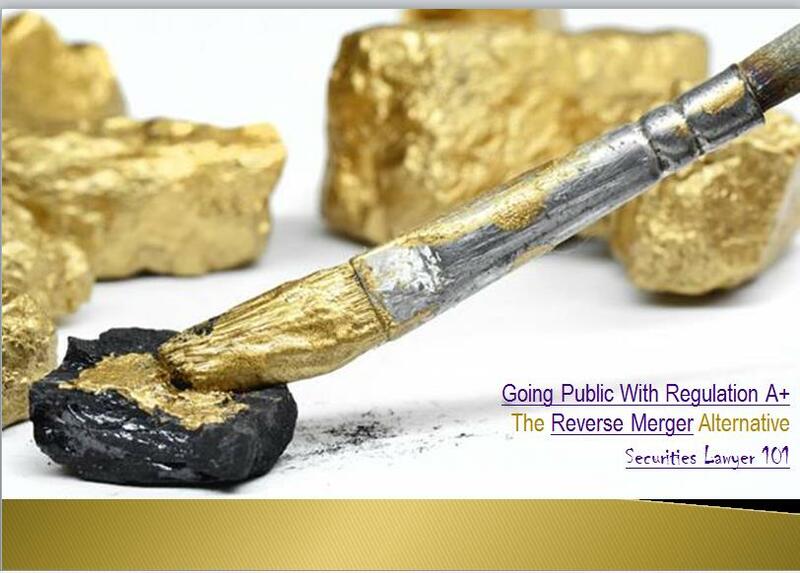 For years, small companies have been the victims of reverse merger purveyors because they had few options available for going public. Regulation A+ changes this by allowing companies to easily meet the requirements for going public with a direct public offering/DPO. Regulation A+ provides a middle ground between private and public company status by allowing companies to transition between being private and going public. Regulation A+ created two distinct offering exemptions, Tier 1 and Tier 2.